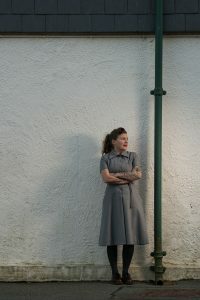 More bio: Sophie won the Out Spoken Award for Innovation in Poetry in 2015 and her work has been published widely including Poetry Wales, Dark Mountain and The Lonely Crowd. She performs regularly across the UK (such as at the Wales Millennium Centre, Hay Festival and with Caught by the River) as has been on stage internationally at the Kolkata Literature Festival, India. Sophie has created two hand-stitched poetry pamphlets, Prophecy: conversations with my Self and Hanes; and collaborated on two touring arts projects: Metaforestry: storiau o’r Gogs, and DRKMTR which was also an album released on the Drum With Our Hands record label. She is a recipient of a Literature Wales writers bursary for 2017, and a Creative Wales award for 2018. The new poetry collection Rebel Sun is out with Parthian Books June 2017.